Weaving. Block printing. Bandhani. An exhibition of exceptional work being done by some of India’s most accomplished contemporary artisans. All five artisans have secured an international reputation through a focus on detail and a dedication to taking traditional techniques to new levels. On hand will be Jabbar and Adam Khatri (ajrakh block printers), Jabbar and Abdullah Khatri (dyers and bandhani tiers), and Shamji Vishram Vankar (dyer and weaver). This is a rare opportunity to see this work close up. The artisans will speak about their work and pieces will be for sale. Traditional ajrakh block printing is one of the most iconic crafts to survive into the twenty-first century. But ajrakh as practised by the Khatris of the Kacchh Desert has done much more than just survive; it has flourished and expanded to become a craft with a keen sense of tradition and a vision for how this tradition can be taken into the future by a new generation of ajrakh artisans. Foremost of those pushing the craft to new levels are the father-son team of Jabbar and Adam Khatri. 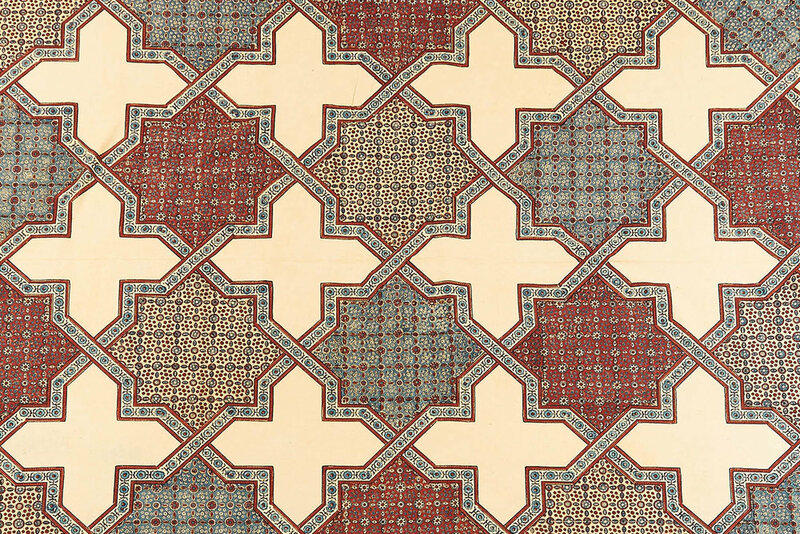 Jabbar in particular has rethought the production and geometry of ajrakh to elevate it to the level of textile masterpiece. His son Adam shares his skill and has a profound fondness for our favourite natural dye—indigo. The Khatris live near Bhuj in the Kachchh Desert of Gujarat, India. Today they produce some of the most outstanding textiles being made. Shamji Vishram Vankar is a weaver and natural dyer living in the Kachchh Desert. He comes from a deep artisan heritage. His father won a prestigious National Award for his weaving. Shamji and his brothers have all inherited a commitment to craft and a dedication to tradition. Shamji recalls the times when lac cakes were available in the local market for dyers: “The colour makes me feel at home. Our elders dyed shawls for Rabari women in lac. I grew up with this colour around me a lot, so it is woven into memories of my childhood.” Lac is now only one of the natural dyes which Shamji uses and weaves into exhibition quality textiles. Shamji is an artisan who has been recognized worldwide, yet who still puts family traditions, technique and slow, careful skill first.